Why Are All These People In Djibouti? Many years ago at a Marine Ball in New Orleans, I sat next to a young officer who had recently returned from Djibouti. I asked him what he had done there, and he responded very politely by telling me everything I wanted to know about Djibouti except what I had asked him. I wondered, but let it go. That was at least twelve years ago, and Djibouti is still an important place to the world’s most powerful nations. One look at its location explains why. On Friday, the Center for Security Policy posted an article with the title, ” Arms Trafficking on the Rise in Djibouti.” So what is this about? Attention was brought this week to the growing issue of arms trafficking in the East African nation of Djibouti, which has seen a spike in recent years. 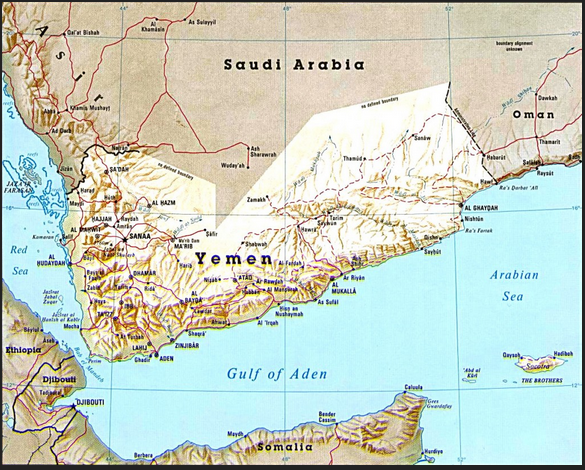 Driving the problem is the instability and ongoing conflict in neighboring countries such as Yemen, Somalia, and Sudan. The negative attention comes as Djibouti is trying to establish itself as a developed and economic upstart nation. …Djibouti’s lack of internal conflicts, its surge of economic investments and its resulting economic growth, have all led to increased stability not present in its neighboring countries. Driving these positive developments are its access to both the Red Sea and the Indian Ocean, resulting in its labeling by some as the “most valuable real estate” in the world. Another major component of Djibouti’s growth has been the military presence of several major world powers within its border such as the United States, France, China, and Japan. France was the first power to establish a military base there as the former colonial power in the region, although budget constraints will require them to close this in the near future. The United States has a strong military presence in Djibouti as the central location of its African-based operations known as AFRICOM. The only foreign bases of both China and Japan are in Djibouti, and India is looking to build a base there in the coming years. The main interest of these countries in Djibouti is the country’s strategic positioning near the Bab-el-Mandeb strait and the Horn of Africa. …China has the largest presence in Djibouti, given its large development and business presence, and owns a significant amount of the nation’s debt. To this point, the United States sought reassurance earlier this year by the Djiboutian Foreign Ministry that Djibouti’s relationship to China would not overshadowed their agreement with the United States. Despite these assurances, concern over China’s heavy presence in Djibouti, and its ability to remain a neutral partner, continues to increase. As Djibouti’s economy and international profile continue to grow, interest in the strategically located African nation will continue to increase from world powers and transnational criminals alike who look to profit from the country’s exponential rise. Stay tuned. This growing country in one of the most unsettled regions of the world is very strategically located. The military buildup by foreign interests in Djibouti is not accidental. This entry was posted in Uncategorized and tagged Center for Security Policy, China, Djibouti, Economy, Somalia, United States by granny g. Bookmark the permalink.